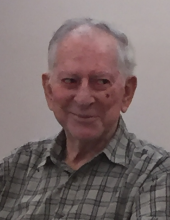 Mr. Donald Bailey Wells, 91, husband of Martha Dailey Wells, passed away early Friday morning, January 25, 2019 at the Telford Terrace Nursing & Rehab in Richmond. Donald was born in Madison County on November 15, 1927 to the late Boyd Dudley and Bertha Azbill Wells. He was a graduate of Madison Central where he played on the basketball team. Mr. Wells loved his family and enjoyed playing golf. He was a member of the Mt. Pleasant Christian Church. In addition to this wife of 68 years, Mr. Wells is survived by: his children, Donald W. Wells (Carol), Lisa Wells McFarlen (Marvin) and Alan Wells (Tammy); two brothers, Dean Wells and Darrell Wells (Wanda); three sisters, Diana Ross, Darlene Sparks (Jim) and Darnetta Congleton (Tommy); one grandson, Andrew Johnston; two step-grandchildren, Misty Jensen and Anthony Poole; as well as a host of other extended family and friends. In addition to his parents, he was preceded in death by: his siblings; Daniel Wells, Dwight Wells, Douglas Wells, Hazel Wells, Opal Wells, Dorothy Butcher, and Doris Patton. In accordance with Mr. Well’s request, private family services were conducted at the Combs, Parsons & Collins Funeral Home. Burial was in the Richmond Cemetery. In memory of Mr. Wells, donations are suggested to Hospice Care Plus, 208 Kidd Drive, Berea, KY 40403. "Email Address" would like to share the life celebration of Donald Bailey Wells. Click on the "link" to go to share a favorite memory or leave a condolence message for the family.